Nokia 3310 – will it blend? The Nokia 3310 is like the Chuck Norris of cell phones. Some say that when you drop it on the floor, the tiles break. Some say that police forces have one embedded in the front of their battering rams. Some say that when December 21 comes, it will be the last man-made thing standing. That's great and all, but will it blend? That is the question Tom provides the answer to with the help of his mighty Blendtec blender. Curious to see which device prevails at the end? Then just check out the video below! And remember, don't try to recreate this experiment at home, especially with a phone not as resilient as the Nokia 3310! Or Rajnikanth (the Indian equivalent of Chuck Norris). You have it all backwards. Only the Nokia 3310 can scratch Chuck Norris. 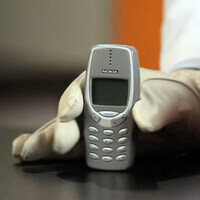 Nothing can scratch a 3310. He should see my phone, now that's a tough phone! This story should've been on 1999 PA's hot topic list...lol!! I mean if PA, existed then!! Who has this phone??? Whose 3310 is that?? What a waste...it's a vintage piece now! Actually you can still buy them new. I saw one for display at a store, retailing for $130 unlocked. Interestingly, it said "Made in Japan" on the tag. Watch the slow mo version, clearly shows the grinder's cup has broken.. In one world this phone is "Miracle" But, when I watch the torture test of Lumia 920, I have to say the 3310 has a big offspring. is it only me or everybody that observed the body of the blender got a serious crack while blending a 3310? You shut your blasphemous mouth. That is the holy grail of phones. I know. Its awesome right! Best phone ever made in the history of phonekind. Nokia should make a successor to this phone. I have a Nokia 5530. All I'm saying is that I threw it at a wall as hard as I could, and the back cover and battery came off. There was a rather large dent on the wall, plaster had come off. I pick up the phone, and notice no difference. All that had happened was 2mm worth of paint chipped from the phone, that's it. If I can't find a brick to throw at a robber, well, after that test, I don't think I'll need to look for one.